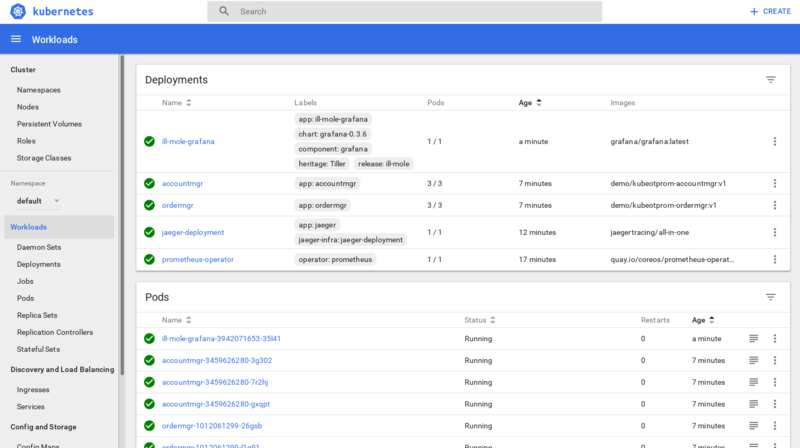 This article will show how OpenTracing instrumentation can be used to collect Application Metrics, in addition to (but independent from) reported tracing data, from services deployed within Kubernetes. 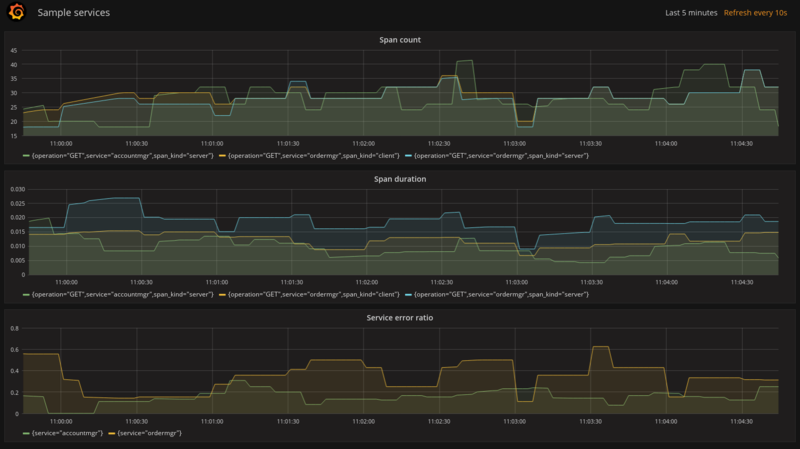 These Application Metrics can then be displayed in your monitoring dashboard and used to trigger alerts. In a recent article we showed how a Spring Boot application could easily be instrumented using OpenTracing. The example we are going to use in this article uses the same approach to create two services, ordermgr and accountmgr. 1 This line simply introduces a random delay, to make the collected metrics more interesting. 2 These three lines randomly cause an exception which will result in the span (associated with the REST endpoint invocation) being tagged as an error with associated log events identifying the error details. 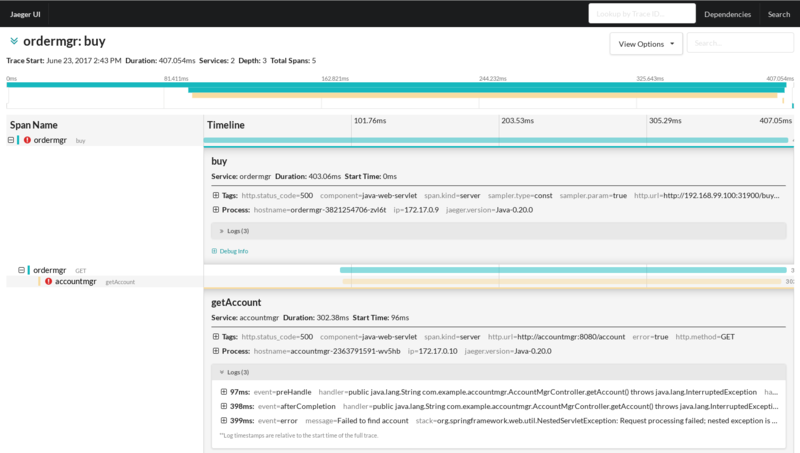 1 The service injects the OpenTracing Tracer to enable access to the active span. 2 All three methods introduce a random delay. 3 The buy and sell methods additionally set a baggage item transaction with the name of the business transaction being performed (i.e. buy or sell). For those not familiar with OpenTracing, the baggage concept allows information to be carried in band with the trace context between invoked services. We will show you how a baggage item can be used to isolate the metrics relevant only for a particular business transaction. 4 Invoking a non-existent endpoint on accountmgr will lead to an error being reported in the trace and metric data. The OpenTracing API defines the concept of a Span which represents a unit of work performed by a service, e.g. to receive a service invocation, perform some internal task (e.g. accessing a database) or invoking an external service. They provide an ideal basis upon which to report metrics (count and duration) regarding these points within a service. Therefore a new OpenTracing contrib project has been established (initially just for Java) to intercept the finished spans, and create the relevant metrics. These metrics are then submitted to a MetricsReporter for recording - the initial implementation of this interface being for Prometheus. This will allow the Prometheus metrics to be obtained from the service’s /metrics REST endpoint. The first method uses the TracerResolver to provide a vendor neutral approach for accessing a Tracer. This tracer is then enhanced with the metrics capability using a PrometheusMetricsReporter. This metrics reporter is further configured to add a special label related to the baggage key transaction (discussed later). By default, the Servlet OpenTracing integration will trace all REST endpoints. Therefore in the second method above we add an attribute that will inform the instrumentation to ignore the /metrics endpoint. Otherwise we will have tracing data reported each time Prometheus reads the metrics for the service. Once they are all running, then the simple example with the two services can be deployed. For this you will need to clone the example code repo, and follow these instructions. This shows that the trace instance has three spans, the first representing the receipt of the /buy request on ordermgr, the second where ordermgr is invoking accountmgr, and finally the accountmgr receiving the /hello request. In this particular trace instance, the accountmgr invocation has reported an error, indicated by the error=true tag. This dashboard includes three graphs, the first showing the number of spans created (i.e. span count) by our sell() method, and we can use it to track how many times this business operation has been executed. The second showing the average duration of the spans, and third showing the ratio between successful and erronous spans. The metrics reported by Prometheus are based on a range of labels - a metric exists for each unique combination of those labels. The standard labels included with the OpenTracing java-metrics project are: operation, span.kind and error. With this particular example, we also included the transaction label. However when the services are deployed to Kubernetes, the following additional labels are included for free: pod, instance, service, job and namespace. In our example Prometheus queries, we have ignored most of the Kubernetes added labels (except service) so that the metrics are aggregated across the specific pods, namespaces, etc. However, having these labels available means it is possible to segment the metrics in whatever way is required to analyse the data. When using the java-metrics project outside of Kubernetes, it is still possible to include the service label, however you would configure this when setting up the tracer. In this image we have filtered the metrics based on the transaction='sell' and service='accountmgr'. This is where using the metric label based on the baggage item transaction can be useful, to understand the usage of a particular shared service by a business transaction. With further work it would be possible to show the distribution of requests for a service across the various business transactions. This article has shown how a service can be instrumented once (using OpenTracing) and generate both tracing and application metrics. When deployed to a Kubernetes environment, the metrics also benefit from an additional set of labels automatically added by the infrastructure, describing the service, pod, namespace, etc. 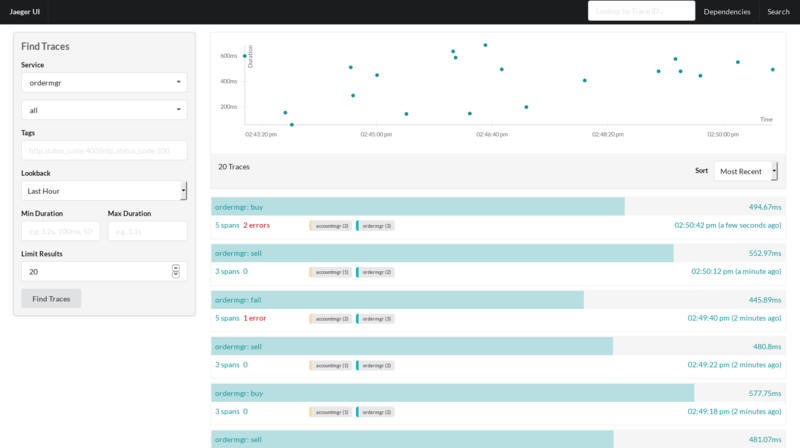 This makes it easy to isolate specific metrics of interest, or view high level aggregated metrics to gain an overview of your applications performance.